Whenever I get a new toy, I'm inclined to devote all the hours necessary to a thorough exploration of all its features. The problem with many toys is that there is too little to explore, leaving me disappointed and wanting more. Not so with the TomTom GO 720. For the month I had it, I was continually discovering new features and capabilities that I wanted to try out, experiment with and explore. Returning it to TomTom was difficult. The GO 720 and I made two reasonably long trips; one to Lexington, VA (about 10 hours, one way, from where I live in Georgia) and one to Auburn, AL (about three hours away, one way). Of course, I also used it when I went to Wal-Mart, to the post office, to see a new neon-red truck at the local car dealership and on many other short trips around town. I couldn't explore all the available features because in some cases the device was more technologically advanced than my infrastructure. For example, I don't have a Bluetooth-enabled cell phone (my cell phone still has a dial), so I couldn't connect to the GO 720, make a call or try out the traffic feature. But I don't believe that my limitations diminished my experience with the GO 720. Navigation heads up: You're notified three times before you need to make a turn. I always forget the first warning so the other two kept me on track. If you don't listen, you can always look at the screen, but that's not as safe. POI icons: Being able to identify the gas stations and restaurants at their locations by logo on the screen is nice. I find it irritating when signs on the interstate say that gas stations and restaurants are to be found at this off-ramp, when they are actually several miles beyond the off-ramp. (This was the case in Lexington, VA.) I thought of this feature as "built-in irritant avoidance." Speed warnings: Here in the middle of Georgia there are a number of jurisdictions that augment revenue with the "Velocity Tax." The GO 720 lets you set a speed and it then beeps if you exceed it. Hearing the beep really beats seeing the flashing red lights and hearing, "You're in a heap of trouble, boy." The GPS lock-in speed: The GO 720 takes just seconds to lock on to satellites, not minutes, like my old GPS receivers. A GO 720 Sinful Omission. A small but easily correctable problem - there was no pouch or other holder to put the GO 720 in to protect the screen while in storage. I can't imagine dumping this in your glove box or briefcase without protecting it from the world of scratches. Dimensions: 4.7" x 3.2" x 0.9"
I appreciated the large screen - you can actually see things on it. It will play through the FM radio in your car or plug into the radio's audio jack, if you have one. It connects to your Bluetooth phone so you can make hands-free calls and access some of the add-on features such as traffic and weather. 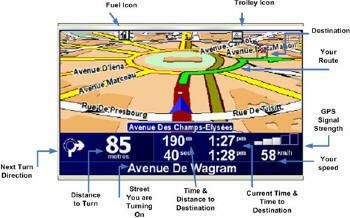 It runs for a long time (about 5 hours) on the internal battery and comes with a substantial quantity of mapping data. Figure 1 shows the basic map view. You can set display options such as the location of the map legend, whether or not you want to see the POIs, and the level of zoom. The menus are accessible with a simple touch of the screen. There are several menus, all touch-activated. Just touch the screen and they appear. 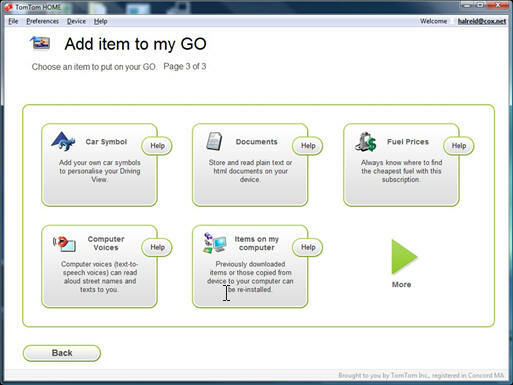 The menus are all icon-based to enable the GO 720 to operate in multiple language environments. Great examples of sub-menus are the Help Me Menus. Phone for Help (Figure 3), provides a list for each category of help and of course, relevant phone numbers. On the Help Me! 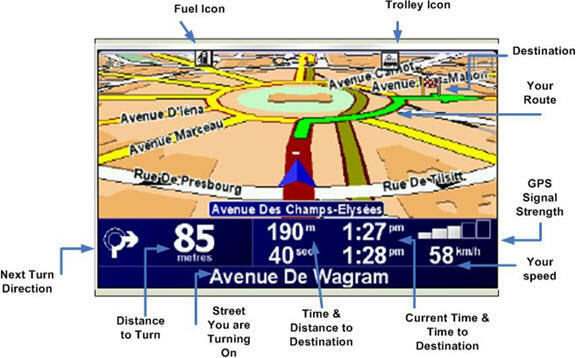 Menu, there is a Where Am I selection which gives you your current intersection or address location, plus the latitude/longitude. If you're not currently on the street network, it gives you the closest reference point. Figure 6. Relative Location Display. While you may think you'll never need the help feature, note that it is not reliant on a cell phone signal, and will navigate you to help even if you are on foot (Figure 7). The GO 720 comes with a CD that contains a program called TomTom Home. When I loaded it, it let me know there was a later version and that I should download it. This program updates your GO 720 and lets you set up routes and itineraries (multiple stop routes), as well as access the add-ons such as traffic, weather and the locations of low cost gasoline. This program is also icon menu-driven, with a look and feel similar to the GO 720. As a user interface, it doesn't get much easier than this. Among the add-ons are a whole collection of voice options, various car symbols (Figure 11), and the ability to load your own music and even audio books. The GO 720 moves beyond a device to get you from one place to another. It is more of a traveling companion; one that doesn't complain, doesn't ask if we're there yet and politely corrects you when you make a wrong turn. It will even read you a story, play tunes and, if you add the weather and traffic (how do you do this? More money?? ), it will route you around areas of congestion and frustration. Think about your car pool and who could be replaced with a GO 720. Think about how much more pleasant that last long trip might have been without having gotten lost. How about the joys of having a travel companion with an off button? Traveling with the GO 720 is like traveling with a guide, a story teller and an advisor. Your GO 720 will always make the trip memorable.